So here is one of my favorites... the SUPER HERO PARTY!!! 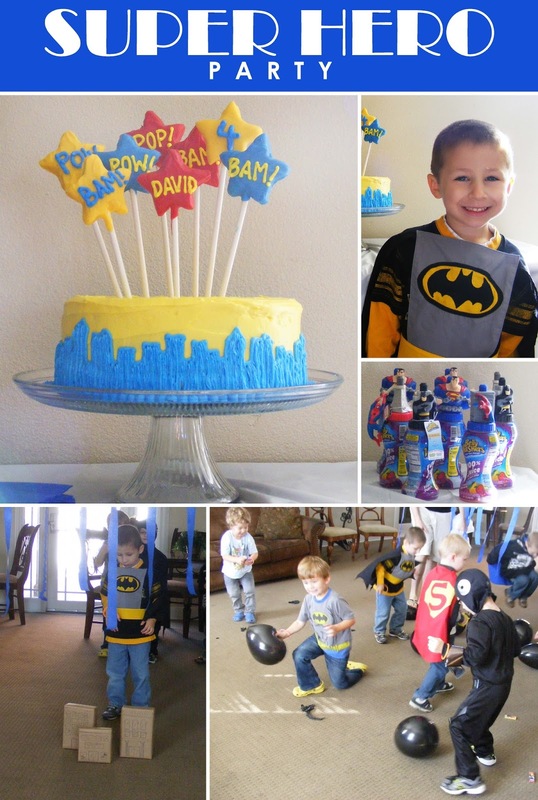 This party was so fun and really quite easy to and inexpensive to put together. Here's a list of all the games, treats, and ideas for you to throw your own. I made a round 2 layer cake, frosted it yellow, and piped on a skyline with blue frosting. Pretty easy. Then I made star shaped sugar cookies and dipped them in colored candy melt and used yellow frosting to write "POW" "BAM" the birthday boy's name, age, and other fun hero phrases. Stick all the fun star cookies into the cake and wha-la! On our invite we asked all the kids to come in their best super hero costumes to help "Save David's Birthday". Not only were they cute... I mean cool, but it made for some great super hero play time. We found these awesome super hero sippy-cups filled with apple juice for cheap (at Walmart). The kids had them as their drink, but also got to take home to cool re-usable sippies. 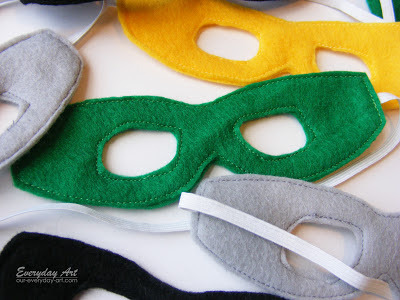 Have you seen my FREE pattern for making super hero masks? So easy and fun. I actually didn't get this done in time for the party, but they would have been perfect! The kids also had treat bags for all the goodies they won playing games. Leap over tall buildings in a single bound!- I covered cereal boxes with paper and drew on them to look like buildings, then the kids took turns 'leaping' over the buildings and through the sky (blue streamers hung from the ceiling over the boxes). Stomp out the Bombs!- I through bombs (black balloons) all over the room and asked the heroes to 'stomp them out to save the party'. Little did they know the balloons were filled with candy!!! Just as much fun as a pinata without anyone swinging stick. Stop the Evil Villain!- This pretty much consisted of the boys (heroes) throwing large marshmallows at he dads (villains) til they gave up. Probably one of their favorite parts thanks to a couple dads that were really good sports. I think that's it! Hope I've given you some SUPER ideas for a party of your own! What a great idea! Love the cake! I love the little felt eye masks!!! Awesome! Thanks! I will totally be trying those! In about 4 years or so...my sons only a year and a half. :) Great party!